The UniverCity Community Association (formerly SFU Community Association) was established in 2002 to address matters of mutual interest to the UniverCity community and help facilitate communication between UniverCity residents, the SFU Community Trust, Simon Fraser University, and outside organizations. The Association’s role is to initiate programs and projects that enhance and promote UniverCity as an attractive community to live and work. The UniverCity Community Association administers the UniverCity Community Granting Program, to support community events and programs. The Association also manages the Naheeno Park Community Garden and acts as a liaison with the Burnaby RCMP and the City of Burnaby on certain issues. 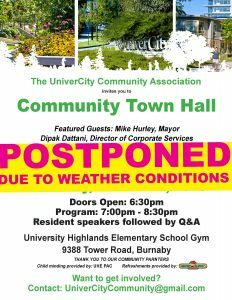 Due to the unpredictable weather conditions on Burnaby Mountain, the UniverCity Community Association (UCA) Town Hall event previously scheduled for tonight is now POSTPONED and will be rescheduled to a later date (TBD). 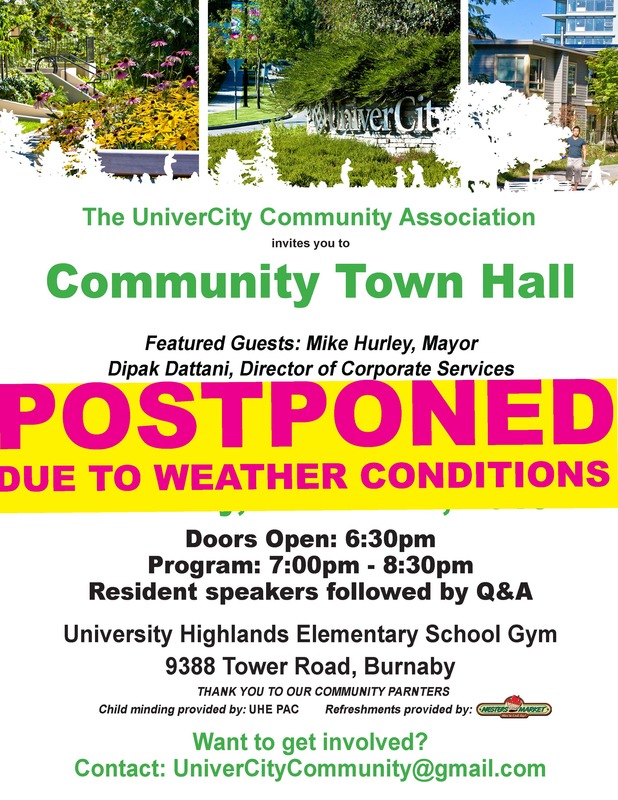 Thank you for your patience and stay tuned for updates on the new UCA Town Hall date. 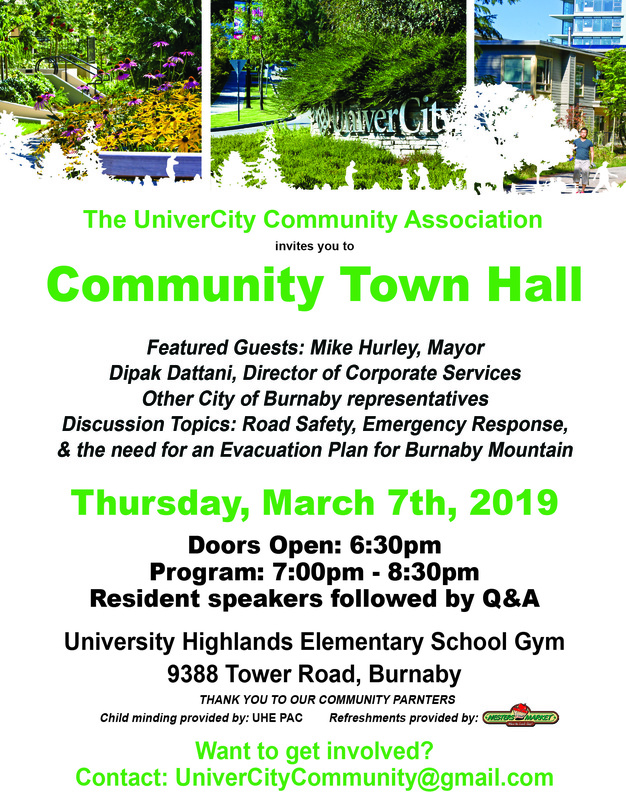 The UniverCity Community Association (UCA) invites you to the first Community Town Hall event in 2019 on Thursday, March 7th at the University Highlands Elementary School with representatives from the City of Burnaby including the Mayor as well as representatives from both Member of Parliament for Burnaby North-Seymour Terry Beech and Burnaby-Lougheed MLA Katrina Chen’s office as the featured guests. This event will focus on the topic of safety and security for the UniverCity community. This event will allow community members to connect with the City and other stakeholders to start discussions within our community. It was wonderful to see so many community members at the inaugural Town Hall event on October 30th hosted by the UniverCity Community Association. Thank you for everyone who attended and participated in the event and discussions. To help the UCA plan for future Town Hall events, please complete our post-event Evaluation Form. For those who were unable to make it, click on the following link to view a video recording of the program. 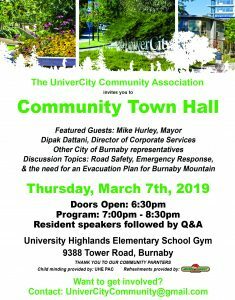 Stay tuned and please check back to this page for information on future UCA Town Hall events.